Ready to invest? Reserve now. Thank you for your interest to our listing. As real estate professionals, we will see to it that you will get personalized service you deserve. You will also get fast responses to questions you may have. We will guide you step-by-step on your purchase. Choose condo unit/s you wish to purchase. This is after you have browsed some information from this website and have communicated with us concerning a specific condominium project. We will prepare computation based on your desired unit. You may also request for special payment term. You are then requested to send the forms with your signature through email attachment (kindly email to: manilacondostore@gmail.com). Please note that this online processing of documents is for the purpose of reservation only. 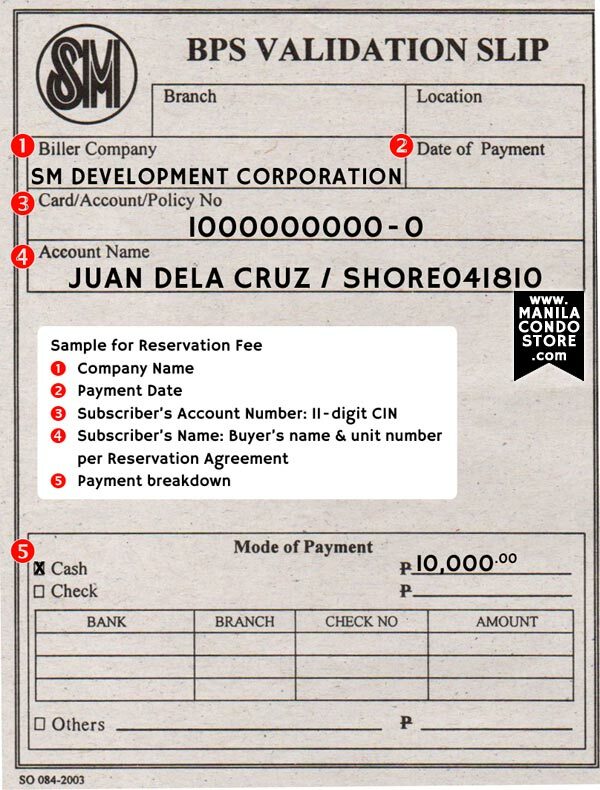 The Reservation Agreement will be signed by SM Development Corporation (SMDC) as your preliminary contract. 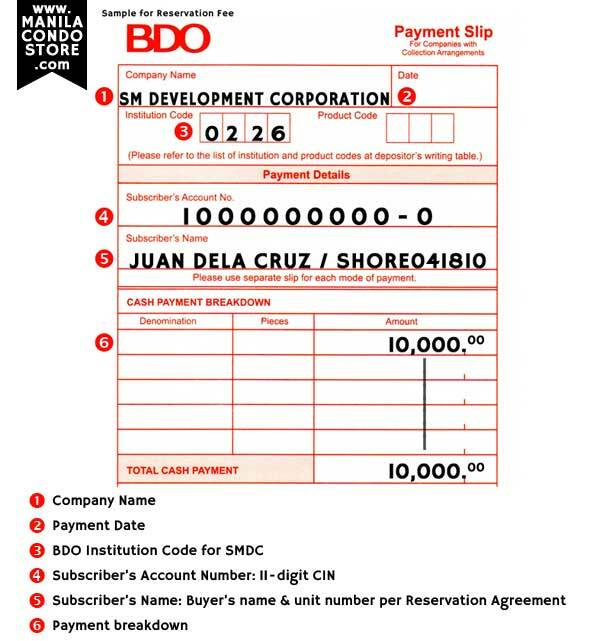 This will make the developer keep the condo unit in your name for thirty (30) days while completing your requirements to purchase. 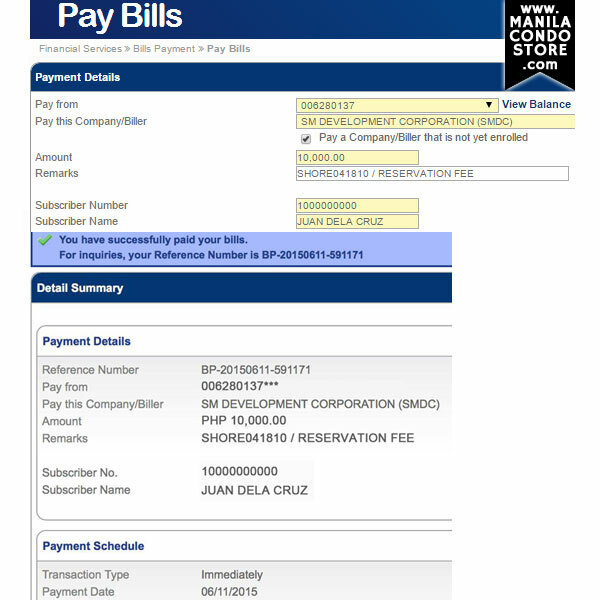 Kindly use the details below when making your payment. Note: For Air, Berkeley, Bloom, Blue, Breeze, Charm, Coast, Cool Suites, Fame, Fern, Field, Glam, Grace, Grass, Hill, Jazz, Light, Lush, Mezza, Mint, MPlace, Princeton, Red, S, Sea, Shell, Shine, Shore, Shore2, Shore3, Spring, Sun, Vine and Wind Residences. Note: For Trees and Green 2 Residences only. Note: For Green 1 Residences only. Note: For South, Joy and Sail Residences only. To complete your reservation, the following documents must be submitted within thirty (30) days. After paying the reservation fee and submission of complete requirements, SM Development Corporation (SMDC) shall be sending through email your Schedule of Payment (SOP) with due dates and amounts. Prepare to pay your monthly amortizations according to the date and amount of your SOP through post dated checks. After checks have been prepared, submit them to SMDC. Please request for a pick-up arrangement from us. The Contract To Sell will be processed once you paid at least 5% of the total amount payable provided all necessary documents have been submitted to SMDC. We will send the original contract papers to you through SMDC's accredited courier. When you receive the original documents and after reading and affixing your signatures on the contract, you are requested to send them back to SMDC two weeks after receipt. After receiving the signed original contracts from you, these documents will be handed over to SMDC who will affix their signature/s and then have these documents notarized by a lawyer. You can then expect to receive a copy of the notarized contract. When the full payment has been cleared or bank loan has been released, you will be issued a Notice of Acceptance through email and mail. You will then be endorsed to Buyers Turnover Personnel so you can inspect your unit.